There is an alarming trend in the field of medicine, whose portents are ominous but do not seem to shake the complacency and merry making doing the rounds. Millions for a Mid-Term. However, the problem is that sponsors keep a discreet but careful tab on docs. All in all, costs of medicines escalate, and quality medical care becomes a luxury. The whole brunt of this movement is borne by the patient. Companies like GlaxoSmithKline, Bayer, Pfizer, Bristol-Myers Squibb, AstraZeneca, Schering-Plough, Abbott Labs, TAP Pharmaceuticals, Wyeth and Merck have paid millions of dollars each as compensation in the last few years. The financial condition of many pharmaceutical majors is not buoyant either. Price deflation, increased Rand D spending, and litigation costs are the main reasons. In the future, the messy lawsuits situation would no longer be restricted to industry. It would involve academia and practising doctors as well. Indian pharma industry captains, who were busy raking in the profits at present, would also come under the scanner. If nothing else, it means industry and docs will have to sit down and do some soul searching. Both short and long-term measures will have to be put into place. Short-term measures involve reduction in i) pharma spending over junkets and trinkets; ii) hype over 'me too' drugs; iii) manipulation of drug trials; iv) getting pliant researchers into drug trials; iv) manipulation of Journal Editors to publish positive findings about their drug trials and launches; v) and for Indian Pharma, to conduct their own unbiased clinical trial of the latest drug projected as a blockbuster in the West, before pumping in their millions. The long-term measures are related to the way biomedical advance is to be charted. We have to decide whether medicine is to become a corporate enterprise or remain a patient welfare centered profession. A third approach involves an eclectic resolution of the two. Such amount of patient welfare as also ensures profit, and such amount of profit as also ensures patient welfare is to be forwarded. For, profit, without patient welfare, is blind. And patient welfare, without profit, is lame. 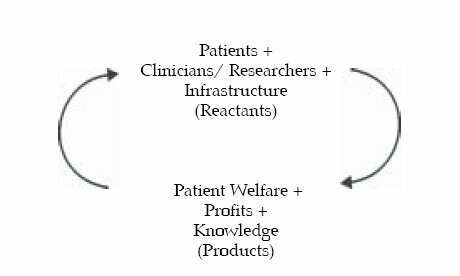 According to this approach, medicine becomes a patient welfare centered professional enterprise. The various ramifications of each of these approaches are discussed in this monograph. There is an alarming trend in the field of medicine, whose portents are ominous but do not seem to shake the complacency and merry making doing the rounds. The party and dance seem to be endless, and everyone involved seems to be having a gala time. The atmosphere is electric, and the mood buoyant. Money seems to flow as smoothly as does the spirit; and the conversation is as sparkling as the wine in tall goblets. Pygmies stand tall in three suits, and wax eloquent in august company. And then shed their formals to shake an informal leg at banquets and cocktails. And the clang of brimming glasses matches the cheer of the spirits that soar in the gastronomy of excited medics. One is reminded of the state of the Yadavas during Krishna's times. Busy with revelry and debauchery. Before disaster befell. And not even the Lord's protestations and caution sounding had any impact. Or, the fall of the Romans at the height of their glory. Who thought nothing, just nothing, could ever go wrong. And were busy indulging themselves in the wildest of orgies before the Roman Empire sank without a trace. Well, you might ask: why are we ringing these alarm bells? It's because the wants (not needs) of the medical man have multiplied beyond imagination. Each one of them wants to be pampered by the pharmaceuticals. Conferences have to be in Five Star hotels, and delegates must be housed in Five Stars too; they must travel by air, and must be shown around the place. Complementary. The odd gift will no longer do. Expensive holidays, foreign trips, personal accessories must be lavishly thrown in to pamper the man of medicine. And he is like a man-eater. Having once tasted the blood of pampering, he will not settle for anything less. The cost of organizing conferences is no longer ever possible on delegate fees. The sponsors have ensured that they can never be done away with. The plastic smiles and courtesies in looking after delegates, who expect all on the house, hide snide but happy inner faces of sponsors. Snide at the way medicine is gravitating. Happy at the way medicine is playing itself completely into the hands of commerce. Crores for a Conference, millions for a Mid-Term. That's the bottom-line. The medical man, of course, never had it so good. He is anointed a God in his clinic, and worshipped with the choicest prasads* by the sponsors. Except for a slight problem. The problem is that the sponsor keeps a discreet but careful tab on him. The sponsorship must translate into prescriptions. Else first gentle and then more insistent reminders make their way into conversation. Well, if the healing man feels irked, it's absolutely on purpose. It pays to be loyal, to write the latest molecule hyped, to speak well of the new drug launch at sponsored CMEs, workshops, conferences etc. Never mind the doc concerned is really not convinced. Who is? The patients get taken in by the new drug bait too. They go along, and the placebo effect of novelty and hype ensure the drug appears to work for a while. Then, a descendo effect stares in the face. Not to bother. By this time a new drug launch is on its way. All this is irksome, wrings the conscience, true. But is conveniently shrugged off. And the merry go round whirls fast, as all the participants hold on to the bar and shriek in glee. Unfortunately, a few spanners in the works have been placed lately. Patients expect drugs to work beyond placebo effect. Patients expect docs to be clean. Patients expect docs not to get involved in a nexus with pharmaceuticals. Look at it from the pharmaceutical's angle. On an average, one new drug comes from the laboratory to the pharmacy shelf after 12 to13 years. It is after 5000 to 10000 promising ones have had to be shelved due to extensive testing in the R and D phase that a drug is approved as a quality, safe and efficient marketable product (EFPIA, 2005). Also several studies put the cost of researching and developing a new chemical entity (NCE) at Euro 895 million (EFPIA, 2005). The R and D costs are staggering. Research driven pharmaceutical companies invest about 20% of their sales in R and D, which represents a higher percentage than any other industrial sector (including high-tech industries such as electronics, aerospace or automobiles) (EFPIA, 2005). Moreover, do not forget. The price of a new medicine carries within it a contribution towards the cost of discovering the next (EFPIA, 2005). Hence that too is an add-on to the MRP. The marketing departments have smart alecks who want handsome pay packets too. The man-eater must have his lion's share as well. And, of course, handsome profits must be made in this booming industry. So they have every reason to add on costs to every new molecule. And try and devise ingenious add-on molecules too, which equally ingenious researchers manufacture, and the marketing departments latch on to. A small twist in a molecule, and a new 'me too' drug is ready for celebrity launch, and potential celebrity status. All in all, costs of medicines must escalate, which means quality medical care must become a luxury. This anyone getting any fancy investigation or treatment will vouch for. The docs also have become market and media savvy, and masters at projecting themselves. All at a price, which their treatments offered must incorporate. The whole brunt of this movement is borne by guess who - that hapless consumer, the patient waiting patiently outside the clinic door. Probably, he had rightly been called a patient. Patient. He has been patient enough. Already ominous portents that he will no longer keep quiet are visible. As the medical man is busy waltzing with the medicine producer, the patient has decided to stop the DJ's enchanting music. How? By filing law suits against industry. The connect between docs and industry was under wraps till a decade ago. Concerns gathered momentum only in the last five years, with the dawn of the new century. That itself was not a small matter of concern. However, the matter of real big concern, which should make the blissfully unaware dancers sit up and take notice, are the recent events detailed below. GlaxoSmithKline, Bayer, Pfizer, Bristol-Myers Squibb, AstraZeneca, Schering-Plough, Abbott Labs, TAP Pharmaceuticals, Wyeth, Merck. None of them small names. And all of them have paid millions of dollars as compensation in the last few years. The pharmaceutical industry no longer commands the respect that once made it a beacon of innovation and achievement (Horton, 2004a). In fact, a former Editor of the New England Journal of Medicine details the ways in which pharmaceuticals are busy hijacking medicine and its research agenda (Angell, 2004). Global sales for AstraZeneca fell by 0·6% in 2003. GlaxoSmithKline grew by only 3·9%; Bristol-Myers Squibb by only 4·0%. The fastest growing company was little-known Schwarz, which benefited from the patent expiry of AstraZeneca's version of omeprazole. Worse, the rate of US market growth-half of global pharma sales occur in the USA-slowed, thanks largely to fewer blockbuster drug launches. 2004 has been no better. Merck has forecast a fall in share earnings. Stock prices for AstraZeneca and GlaxoSmithKline have been extraordinarily volatile. As big pharma feels the squeeze, it seems its chief executives will risk litigation and court settlements to extract the maximum revenue from increasingly unforgiving markets (Horton, 2004a). On 22nd Oct 2005, a leading newspaper reported an interesting, if rather disquieting, story (TNN and Agencies, 2005). Ranbaxy, a pharma multinational from India, reported a Rs.10.77 crore loss in Q3 (the third quarter of 2005, ended Sept 30), as against a net profit of Rs. 141.3 crore for the same period last year. The reasons: continuing price deflation in the US market, increased R and D spending, and litigation bills. The main reason cited was increased R and D spending, which rose by 79% as against the same period last year. But also mark the last item. Litigation bills. The CEO and MD, Mr. Brian Tempest, is reported to have said that they had a budget of US $ 30 million as litigation cost for the year, adding that the budget was going to remain more or less the same next year. So, pharmaceuticals had indeed started budgeting for this eventuality in right earnest. * Also worth noting was the fact that for Ranbaxy and its subsidiaries, its PAT (profit after tax) was down by 90.8% in Q3, from Rs. 200.1 crore to a measly Rs. 18.4 crore. Moreover, price deflation in the world's biggest pharma market, the US, was on in right earnest, and the situation was hardly likely to improve in the rest of the year. Result: a tighter squeeze on profit margins. And if a drug really bombed, the litigation bills could inflate to ominous proportions, wiping out profits. The company expected to make up by new drug launches lined up for next year, and two of them in early 2006. So hopes were kept alive. But worth noting was the fact that the tide had turned towards the red. And the reasons were not hard to find. Price deflation, increased R and D spending, and litigation costs. And what was happening with Ranbaxy was not an isolated phenomenon. The impact of these three factors were being felt all over the industry and were worth a close look before matters reach an irreparable stage. We say so even if the pharma industry seems to be riding a crest at present. For, the crest may quickly transform into a trough if urgent measures were not carried out now. Why price deflation, increased R and D spending and litigation costs? Let us briefly look at the three factors: price deflation, increased R and D spending and litigation costs. Because activists and regulating authorities are firmly resisting any further cost escalation. They have had enough. They can see through the 'pharma-doc' merry-go-round game, and are busy decelerating the wheel. And charging fees for the deceleration too! Why increased R and D spending? Because R and D has become more an eyewash, and drugs with real potential to swing profits the company way on merit are hardly coming through. Most industry is busy producing also-rans and second quality make-believe champions for drug launches (the so called 'me too' drugs). Which is because industry is busy recruiting and manipulating pliant researchers to skew results. Ultimately, this must result in inflated R and D bills, with no big profit-making real blockbuster drugs coming out of the assembly line. For, the drug's innate quality, its rigorous clinical trial and market potential - all were being blissfully tampered with at every stage. Fudged figures, inflated positive results, and suppressed adverse effects might get a drug approved and launched all right. But ultimately it will falter at the litmus test of patient welfare. Improvement is bound to be poor, and, more important, side effect profile is likely to be great. In an already compromised patient population exposed to numerous health hazards from all around, side effects are likely to be experienced all the more so. And this state of affairs is not likely to abate in the foreseeable future. However, this is hardly a serious consideration for industry, wallowing as it is in profits made hitherto. But not for very long, as profit margins are getting squeezed. And the squeeze was being felt all over the industry, which might get converted into a stranglehold if suitable action is delayed further. Apart for the usual infighting with fellow pharmaceuticals and others over patents and other rights, because side effect profile was either not studied, or conveniently suppressed. However, as side effects make their presence felt, (and this will increase in the days to come), industry runs for cover. And the activist-advocate guns are out shooting wildly. Lawsuits are slapped. Patients and lawyers make a killing. And big pharma, for all its clout, becomes a lame duck in the bargain. Well, you could say, and justifiably so, that they asked for it. But the flip side is that all cost escalation would ultimately be passed on to the consumer. Bad for him, but equally bad for the producer. For it could result in an inevitable backlash from the consumer, resulting in price deflation. And could also result in decreased sponsorship for docs and researchers. Maybe not a flip side, if you looked at it a little calmly. For we all know what use most from the medical fraternity are busy making of this juicy sponsorship carrot dangling in front of their eyes. Hopefully, it may set a much-needed rethinking process into motion, both from the sponsors and the recipients. For, nothing works better to reorient thinking than a big jhatka . * A real jolt that shakes the very foundations of present thinking so that one goes hunting for a better one. The present spate of litigations would have served their purpose very well if this happened. What did all this mean? If nothing else, it meant industry would have to sit down and do some soul searching. Enough of cost escalation to pamper docs and their appendages. They would have to bring it down to manageable proportions. Enough of spending over questionable researches from high spending R and D departments. Or over pliant researchers in academia who produce stillborns. Enough of fudging with figures. Enough of portraying also-rans as champions. Enough of suppressing adverse effects. Enough of games playing. For the game was almost up. Well, what should they do? They should try and go for the real champions. And work their R and D smart alecks to clean up their act. And the marketing departments would have to work over and project the real winners. And patients would have to really get well. And side effects come down to a minimum. And mainstream medicine would have to once again assume its rightful place as a beneficiary of patients. Which position it appeared in danger of relinquishing to alternative and so called complementary medicine at present. Would the guys who matter remove the blind-fold? Or, are they ready to get handcuffed? And tried in the court of the present, and condemned in the court of posterity? The choice is better made now. Is The Spate of Lawsuits Going to Increase? The recent spate of lawsuits, no doubt, has had a significant impact on the reduced profitability of pharma majors. And if the present is any indicator of the future, this is only going to increase. Surely, a disturbing enough development to take a short break in the merry making, and conduct a small appraisal of events before further spokes in the wheel ground it altogether. There is a silver lining to this whole phenomenon. The number of recent lawsuits successfully brought up against industry reflects attempts by patient welfare bodies and others to remedy the tilt in academia-industry relationship, which was decisively swinging towards the latter. It will result in a newfound confidence in academia that augurs well for academia-industry relationship in the long run. For academia had, in a way, given up the fight, deciding to play second fiddle to industry. And join the merry bandwagon of industry orchestrated biomedical advance. Although one must be careful not to overbalance the other way too. For it is naive to believe that all academia-governmental-activist victory is necessarily beneficial for patient welfare. Amongst other things, the cost of litigation is bound to be passed on to patients (Singh and Singh, 2005), someway or the other. And it is necessary to chastise industry, true, but disastrous to uproot major pharma players from business itself, as some lawsuits have the potential of doing. This is where temperance is called for, which activists may lack for obvious reasons, but government and academia must exercise, and judiciary ensure. What Do These Lawsuits Indicate? What do these successfully fought lawsuits against industry portend? They mean patients, and their activists, are no longer ready to buy the patient welfare bait. They have seen through the game, and want their rights protected. They will increase their surveillance in the days to come. And the legal profession will have its hands, and pockets, full. A pretty messy future, if ever there was one. As more suits are successfully brought up against industry, it would affect company bottom lines. And the merry funding of academia and professionals would come under pressure. The messy lawsuits situation would no longer be restricted to industry. It would involve academia and practising doctors as well. The press and media were having a great time anyway, portraying in gleeful detail the malpractices of erring docs. To this would be added the details of financial sponsorships of doctors and researchers. And how that influenced publication of research findings in prestigious journals, and translated into prescriptions and profits for sponsors. Already books by concerned academics that exposed the messy goings on were on their way to making it to bestsellers' lists. Public awareness would increase, and so would lawsuits against the man in white coat as much as the man who made the white pill. Of course reputations would take a real beating all around. The docs would rant and run to protect themselves. Consumer courts would be as active as professional bodies of docs: one exposing, the other protecting them. And the activist would cozy with the man in black coat to go hunting for the one in white. This is what these lawsuits indicate. Indian pharma industry captains, who were busy raking in the profits (for the pharma industry never had it so good), would also come under the scanner. One might expect Indian trends to follow western trends, as it does in everything else. Lawsuits against Indian pharmaceuticals were also bound to go up, as they blindly imported western technology and drugs, often without even the fig leaf of a multi-centered clinical drug trial. Drugs that come under the legal scanner abroad are hardly likely to escape a similar fate here, especially because western technologies, and latest drugs, were making a swift entry into Indian markets. Gone were the days when obsolete technology, or obsolete drugs, entered India. Now, because of the opening up of world economies and liberalization, drug launches abroad find very quick echoes in Indian markets. Which was good to rake in the profits, but would be disastrous when drugs like Voixx and Lipitor bombed. Because so would their Indian counterparts. And Indian pharmaceuticals would soon start running up huge compensation bills, which would seriously start eroding company bottom-lines. So there was every reason for them to sit up and take notice of the impending storm too. One hates to be a doomsday prophesier. Or a spoilsport. But the writing is clear on the wall if the blinkers could be removed for a while. But all this can change. And it better change. How? The steps will have to be short-term and long-term. But both will have to be taken now, if reputations have to be protected, and medicine has not to become unduly protectionist or combative, both of which would go against its essential thrust and purpose - the principle of beneficence. Reduce Pharma spending on junkets and trinkets. Increase search for real trend setters in drug research rather than hype over the 'me too's'. Avoid manipulation of drug trials so the real champion could be separated from the 'also rans', and then go for the publicity blitz, if at all. Avoid getting pliant researchers into drug trials, for they were a deadly component of the production of 'me too's', and the movement towards manipulation of drug trials. Avoid manipulating Journal Editors to publish positive findings of their drug trials and launches. For the final arbiter was the patient, and if he did not get well, or if he suffered side effects, both the pharma concerned and the pliant researcher and journal would have the muck hurled in their faces. And suffer reduced credibility, which would only hurt their fortune in the long run. For Indian Pharma, to conduct their own clinical drug trial of the latest blockbuster so projected in the West, and find out whether it was really worth the hype. For they may be betting their millions on a lame horse. Secondly, they must use the services of researchers whose credentials are above board. Apart from ethical reasons, it was also simply because they would then know the truth. And could then decide whether they could pump in their millions to hype it up. And rake in the profits that would inevitably ensue. The long-term measures are related to the way biomedical advance is to be charted. It is intimately related to the way we look at ourselves today, and wanted to be considered by posterity tomorrow. Which may not be as charitable as we may wish it to be, if we did not make some fundamental and foundational moves today. For that we must take a close look at the prevalent scene. There are two parallel developments in medicine today. Both seem to be at loggerheads, and both vie for our attention. The first, which is manifestedly more recent, (but which, we suspect, has been present in the field for a long time), would want us to think of medicine as a corporate enterprise. The other, which is hallowed by tradition, passed on from generation to generation, and considered the essence of good medical practice (but which, we suspect, more mouthed than practiced), considers it a patient welfare centered profession. Let us here consider the essential thrust of their respective positions. This approach would insist that if medicine has to continue its forward movement as it is, it has to become a corporate enterprise. In other words, it must be run as an industry. Profit should be its watchword. Patients should be clients who are offered services as different packages. And research advanced according to what earned more profits, not necessarily guided by what served patient interests on a large scale. In other words, medicine turns into business. And, as all socially conscious business enterprises do, it could apportion part of its funds from profits accrued for socially relevant causes. This could include welfare of socially and economically disadvantaged sections, and those disease entities which were rampant but whose treatment does not rake in the dollars. Like it was done in all socially conscious businesses, which apportioned a percentage of their profits for socially relevant causes. But none of this at the cost of their primary motive, which was business to make handsome profits. In this model, ethical practices are to be followed, but those of a business, not of a profession. The basic difference between the two being that for the former it is profits with patient welfare, and for the latter it is patient welfare with profits. For some the difference may be difficult to spot. But it will be immediately clear when we say that for a doctor, medical practice means getting the patient well with charging a fee, not charging a fee with getting the patient well. In other words, it is a matter of what gets precedence, and what will not be forsaken in case of conflict. A sound corporately run medical practice would ensure there was minimal conflict between profits and patient welfare. In other words, it would indulge in only such profit as resulted from, and in, patient welfare, and carefully eschew all others. But, it would run it as an efficient corporate enterprise. There are many advantages in this approach. Infrastructure, paramedical staff and treating doctors' qualifications and practices would be spruced up and become more evidence based. Patients would get the most recent medical care delivered efficiently and competently. The patronizing and condescending attitude of physicians, their fossilized and archaic knowledge and practices, will be eased out. Hospitals would become cheerful looking, sparkling places, like well-run business premises are. Not the dim dingy looking spaces, with patronizing, ill mannered but golden-hearted docs that still are the norm at most places all over the globe. There are four main hitches here. One is the massive cost escalation, which is inevitable. The cost escalation could be managed by competition, and increased earning capacity of the consumer. Plus the attitudinal change that better facilities came at a price. And medical facilities also were like any such facility you paid for. You could not get five star facilities at one star prices. And profit was not a dirty word in medicine. In fact it was desirable, but according to certain sound business practices which maintained ethical parameters of a good business. And whoever said business could not be run on ethical principles? And whoever agreed that profits must involve fleecing someone, or duping a hapless customer? Those days were past, mainly because the consumer was well aware of his rights, and vigilant and emphatic about exercising them. And legislation and activism were his comrades in arms. Second hitch is neglect of disease conditions that afflicted the socially disadvantaged, whose treatment could not rake in the dollars. In such spheres, government and philanthropic organizations, with partial subsidy from medical business with social responsibility, could manage to do justice. Or medical business would pay a 'Social Welfare Tax,' which could go to finance such needy activities. Third hitch is how to curb the questionable business practices of the less scrupulous, which would have a field day when the fig leaf of being a profession was removed. Here market forces would play their role. As would practice guidelines by professional bodies and guilds. As well as peer review and pressure. As also legislation. And of course vigilant patient welfare bodies and activists, and the ever-hanging Damocles' sword of litigation. All in all, numerous checks and balances would be in place to see to it that profit maximization was not at the expense of patient welfare. In fact it was based on, and maximized, it. Fourth hitch is how to tackle forces of the marketplace, which compel questionable activities on to a business concern. Medicine would be no less immune to it. Overhead costs, infrastructure upgradation, competition/unhealthy practices from fellow corporates in the field, cost over runs, over investigation and lengthier indoor stay, costlier treatments and investigations - all these add on to medical costs. And while some of these factors are inevitable, making medicine a corporate enterprise may legitimize so many others. The way out is again the same forces of the marketplace, which will help keep medical costs under check because of competitive pricing, enlightened consumer activism, and necessary judicial support to tackle the erring. There will be some black sheep in this enterprise. But appropriate procedures would take care their influence is at a minimum. In any case there are black sheep in the medical profession even today. And there is no evidence to prove that calling medicine a profession rather than a business has reduced its prevalence. In fact it may have given it a license to continue under wraps. Greater accountability, more transparency, and heightened efficiency are what the sick consumer could then ask for, and get. Ancillary businesses, like those of medical appliances, hospital construction, medical insurance, and paramedical manpower would get a boost, which would generate more employment and increase earning capacities to pay for better and more costly medical care. All in all, a great way to lend direction to this important development in medicine, which can easily lose its way to the unscrupulous if not guided at this juncture. Or lose momentum by actions of self-proclaimed guardians of morality, if its positive energies are not harnessed. Let us look at the contention of the second approach now. If medicine has to remain a patient welfare centered profession, dedicated mainly to amelioration of suffering of humanity, and profits/positions/ prestige are only to be attractive perks not the main thing, then something real drastic will have to be set into motion right away. The medical man, and the academic researcher, will have to reign in his avarice. The pharmaceuticals will have to cut down on the pampering of the medics. The profit margins will have to be wholesome but not awesome. Genuine research will have to be forwarded, not spurious questionable activities that are on the upswing at the moment. Patient welfare will have to become paramount, regardless of profits. Diseases that afflict major populations will have to remain thrust areas regardless of the quantum of profits generated. And research itself, on the whole, will have to be guided by what is the need of the populace, rather than what is the fancy thing at present. Or what potentially raked in the dollars for the sponsor or the corporately run hospital. The hallowed profession of medicine traces its lineage to the greats who sacrificed their lives working for disease amelioration. Medicine is a sacred and noble profession, and the suffering of a patient is its greatest challenge, regardless of what and how much it earned for the doctor concerned. No doubt he expects a reasonable life, with its comforts. But he does not vie with, or envy, the businessman who could throw his money around. He has no need for such funds. Yes, he did need funds to support him, and his research. And he did need the funding agencies to make sufficient money to survive and sponsor medicine's onward march. But he is not to be a party to avarice and greed in the name of medicine, in himself or others. He is especially averse to cost escalations of drugs because of pampering of the medical man. He wants stringent procedures in place so that the compromised researcher, or industry major, could not manipulate results and take patients, and medicine itself for a ride, or lead it up the wrong alley. He wants a clear distinction between the business of medicine, which industry follows, and the profession of medicine, which the medical practitioner/researcher should. He wants regulatory mechanisms to be set in place for industry, and wants that on a war footing. He also wants no interference in his work from industry, which wants to involve him in questionable activities. He knows that the compulsions of academia/practice and industry are essentially different. He wants each to respect the others' domain, and not infringe. But he finds industry trying to influence, and modify, medicine to suit its ends. And finds pliant medical men ready to play game. And he finds that an alarming state of affairs. He would not want money and grants to play as great a role as it does in medical practice and research today. The stilted growth of medical research towards what benefited the sponsors, while the whole mass of research and practices, which cries out for attention, remains conveniently neglected, is alarming. It has to be remedied on a war footing. The number of lawsuits against industry indicate the patient was now awake and would not be taken for a ride. While this is heartening, the fallout of this could be a spoke in the momentum of medical advance, which he bemoanes. Moreover, malpractice suits against his colleagues maybe a manner to pull up the black sheep. But its increase is intimately related to how questionable business practices have entered medicine, and ruled the hearts, and minds, of the man whose primary work is to heal. Hence, he would want the essential patient welfare thrust never to be lost. The medical man ever to remain dedicated to it. The medical ancillary industry, pharma sponsors included, to play second fiddle, and earn their millions as a result of, not while dictating, the way medical science had to progress. The patient is the boss, his welfare is the mantra , and the doctor and other paraphernalia are the means to ensure it. In this profits are needed to forward the onward march of the boss' welfare, but it could never be at the cost of his welfare. This should be, and would always remain, the guiding force. Doctors would have to rein in their avarice, which makes them play into the hands of industry. So would researchers. Industry would have to rein in its questionable methods to rake in profits. Patients would have to rein in their methods of intimidating both by flimsy lawsuits to claim huge compensations, which may get the money in and embarrass industry/medical men, but would ultimately result in cost escalation of medical services and defensive medical practice, both detrimental to his welfare. In other words, a massive movement to set priorities right by all the players concerned. And medicine once again to assume the role it was originally envisaged to play. To dedicate itself to disease amelioration; to dedicate itself wholly and solely to patient welfare. And to nothing else. And staunchly resist any moves from any quarter, howsoever mighty and howsoever tempting, to waylay it from this path. In other words, it is a choice between the expedient and the ideal. The choice is rather difficult. But it is better made now before circumstances force it on us when we are least prepared. However, the problem is that the two approaches, both strongly convincing in their own way, leave us at a loss. Which to follow, which reject? And on what grounds? The first one gives paramount importance to profits, but through the process of patient welfare. It appears attractive, and a worthy resolution of the problem. The second emphasizes patient welfare while not denying the value of commerce. It concentrates on medicine as it has been traditionally practiced. Is it time to give up on the traditional and move on? We think it is time to give up on neither, but to resolve issues with an eclectic approach based on a healthy resolution of these two. And move on. While success is important, it can become enduring only if it is based on a strong foundation of values. Define what you stand for as early as possible, and do not compromise with it for any reason. You can't enjoy the fruits of success if you have to argue with your own conscience (Premji, 2004). In other words, ethical guidelines are possible in business as well. In fact the whole field of business ethics seeks to forward precisely this. It is difficult, is prone to manipulation. And the majority, which cares two hoots at times, knocks it about. But it is implemental if we do not mentally sanction ulteriority as integral to business. Patients are correctly identified, diagnosed according to evidence-based criteria, and handled with care, compassion and competence. Infrastructure updates itself periodically, and is tuned to react positively with the clinician/researcher. Again, something requiring quite an effort, especially the second part. Processes that ensure quality control of these two reactants have to be firmly in place. For that, all those involved in formulating, regulating, modifying and evaluating procedures and processes to ensure quality check, control of reactants, and absence of pollutants have to be an ever-vigilant lot. And their procedures and processes have to be constantly updated. Like your Windows, or the anti-virus installed in your computer. That is one side of the story. Profit, without patient welfare, is blind. Patient welfare, without profit, is lame. Similarly, a blind patient welfare and a lame profit would also spell chaos. Blind patient welfare manifested as fanatical proponents of patient welfare who could see no merit in profits. Such thinking is naive and would receive only lip sympathy, if at all. Similarly, lame profit, which could not provide the funds for scientific research would be equally disastrous, and could be the result of a blind patient welfare. It must be essentially lame patient welfare complemented by essentially blind profit. They have to coexist without switching roles, or usurping each other's domain. There is no option for both of them if they wish to survive in the long run, and resolve their conflicts amicably. In short, we think of patient welfare as the center around which everything revolves, and forsaking which nothing does. And we continue to believe medicine is a profession. Meaning thereby, it is bound by the rules of professional ethics, requiring certain essential qualifications as enshrined in regulations by certain statutory authorities. But it is also, though not equally, an enterprise wherein the profits that accrue from its practice can be considered legitimate if it does not forsake patient welfare at any stage of its planning and action. Cost of medicines escalate unreasonably because of increased R and D spending over 'me too' drugs, catering to the wants of the medical man which have multiplied beyond imagination, expenses over conferences, litigation, hype by the marketing departments, and keeping all those in power sufficiently satisfied to help push a drug from the laboratory shelf to the pharmacy one. The cost of organizing conferences is no longer ever possible on delegate fees. The bottom-line is: Crores for a Conference, Millions for a Mid-Term. The problem is that the sponsor keeps a discreet but careful tab on docs. All in all, costs of medicines escalate, which means medical care becomes a luxury. The whole brunt of this movement is borne by the patient. Companies like GlaxoSmithKline, Bayer, Pfizer, Bristol-Myers Squibb, AstraZeneca, Schering-Plough, Abbott Labs, TAP Pharmaceuticals, Wyeth and Merck have paid millions of dollar seach as compensation in the last few years. The financial condition of many pharmaceutical majors is not buoyant either. Price deflation, increased R and D spending, and litigation costs are the main reasons. In the future, the messy lawsuits situation will no longer be restricted to industry. It will involve academia and practicing doctors as well. Indian pharma industry captains, who are busy raking in the profits, will also come under the scanner. If nothing else, it means industry and docs would have to sit down and do some soul searching. Both short and long-term measures will have to be put into place. Short-term measures involve reduced pharma spending over junkets and trinkets, hype over 'me too' drugs, manipulation of drug trials, avoiding getting pliant researchers into drug trials, manipulating Journal Editors to publish positive findings about their drug trials and launches; and for Indian Pharma, to conduct their own clinical drug trial of the latest blockbuster so projected in the West. The long-term measures are related to the way biomedical advance has to be charted. To decide whether medicine is to be a corporate enterprise or a patient welfare centered profession. Medicine as a corporate enterprise means ethical practices are to be followed, but those of a business, not of a profession. The basic difference between the two being that for the former it is profits with patient welfare, and for the latter it is patient welfare with profits. There were many advantages in this approach. However, there are four main hitches here. One is the massive cost escalation. Second hitch is neglect of disease conditions that afflict the socially disadvantaged. Third is how to curb the questionable business practices of the less scrupulous. Fourth hitch is how to tackle forces of the market place. Greater accountability, more transparency, and heightened efficiency are what the sick consumer can then ask for, and get. A third approach involves an eclectic resolution of the two. Patient welfare is necessary , but not a sufficient enough criterion. We think a healthy proportion is patient welfare with profits, in that order. Such amount of patient welfare as also ensured profit, and such amount of profit as also ensured patient welfare. Because, profit, without patient welfare, is blind. And patient welfare, without profit, is lame. Hence medicine becomes a patient welfare centered professional enterprise. By an enterprise we mean here an activity wherein the profits that accrue from its practice can be considered legitimate if it does not forsake patient welfare at any stage of its planning and action. However, if an essentially blind profit decides to chart the course and determine the destination, it would spell disaster. Similarly an essentially lame patient welfare would also falter. Also, a blind patient welfare and a lame profit would also mean chaos. The resolution has to be the combination of an essentially lame patient welfare riding an essentially blind profit motive, so both can complete the journey. How can the problem of price deflation, increased R and D spending and litigation costs of pharmaceuticals be solved? How can conference costs be kept within such control that sponsors cannot exercise undue control over conference activities and participants? Lawsuits against industry are on the increase. Lawsuits against doctors will rise as well. Any solutions come to mind? Can medicine be acceptable as a commercial enterprise? Will we be able to keep medicine patient welfare oriented? What measures would be necessary to ensure this? Does it make sense to combine patient welfare with profit? What to do when the latter tries to dictate to the former? If patient welfare is lame and profit is blind, the two handicapped are likely to deny their handicaps and blame the other for mishaps. What can be done to ensure that this is minimized? What should Indian pharma do to establish its presence as a genuine world player, and not just a conduit for profit making in the name of new molecules launched in the west? How can genuine R and D efforts be enhanced in India? Can doctors/researchers decide research agenda and minimize untoward industry influence over research, and how? If we think of medicine as a patient welfare oriented professional enterprise, does it not amount to granting legitimacy to nefarious business influences through the back door? vi) will combine the worst of both. As a medical man, do you regret taking up medicine as a career? Will you encourage an ethical minded bright young person to take it up? 1. Angell M., (2004), The Truth About The Drug Companies: How They Deceive Us, And What To Do About It, New York: Random House. 2. Datamonitor Newswire (2005), Pfizer sued over marketing of Lipitor, Pharmaceutical Business Review Online , 30 Sept 2005. 3. EFPIA, (2005), European Federation of Pharmaceutical Industries and Associations, FAQs, available at: http://www.efpia.org/tools/faq.htm (Accessed on 27 October, 2005). 4. Harris G., (2004a), Guilty plea seen for drug maker, New York Times , July 16, 2004, A1. 5. Harris G., (2004b), As doctor writes prescription, drug company writes a check, New York Times , June 27 , A1. 6. Horton R. (2004a), Business as usual, The Lancet , Vol. 364, p1209-1210. 7. Horton R. (2004b), Vioxx, the implosion of Merck, and aftershocks at the FDA, The Lancet , Vol. 364, Issue 9450, p1995-1996. 8. Peterson M., (2003), AstraZeneca pleads guilty in cancer medicine scheme, New York Times , June 21, 2003, pC1. 9. Premji A. (2004), Business Times, The Times of India , 30 Sept. 2004, p15. (Quoted on masthead). 10. Singh A.R., Singh S.A., (2005), Psychiatry, Medical Practice and the Pharmaceutical Industry: And Ever the Trio shall Meet-II: Public Welfare Agenda or Corporate Research Agenda? Mens Sana Monographs , III:2-4, July-October 2005, p41-78. Quote on p70. 11. TNN and Agencies (2005), Ranbaxy records Rs. 11 crore loss in Q3, Business Times, The Times if India , Mumbai, Saturday, Oct 22, 2005, p 17. 12. United States v. TAP Pharmaceuticals , (2001), Sentencing memorandum of the United States, Criminal Action No. 01-CR-10354-WGY, Dec.14, 2001.